In 1908, Alpha Kappa Alpha Sorority, Inc. became America’s first Greek-letter organization established by Black college women. Her roots date back to Howard University, Washington, D.C., where the idea formation was conceived by Ethel Hedgeman Lyle of St. Louis, Missouri. She viewed the Sorority as an instrument for enriching the social and intellectual aspects of college life by providing mental stimulation through interaction with friends and associates. Through the years, however, the function of Alpha Kappa Alpha Sorority, Inc. has become more complex. After her incorporation as a perpetual body in 1913, Alpha Kappa Alpha Sorority, Inc. gradually branched out and became the channel through which selected college-trained women improved the socioeconomic conditions in their city, state, nation, and the world. In a world in which materialism is pervasive, and technology and competition have decreased the need for collaboration and cooperation, it is critical to have an association that cuts across racial, international, physical, and social barriers to help individuals and communities develop and maintain constructive relationships with others. Alpha Kappa Alpha Sorority, Inc. is that vital organization. Alpha Kappa Alpha Sorority, Inc. is a sisterhood composed of women who have consciously chosen this affiliation as a means of self-fulfillment through volunteer service. Alpha Kappa Alpha Sorority, Inc. cultivates and encourages high scholastic and ethical standards; promotes unity and friendship among college women; alleviates problems concerning girls and women; maintains a progressive interest in college life; and serves all mankind through a nucleus of more than 300,000 college-trained members in the United States, the Caribbean, Europe, and Africa. Candidacy for membership into Alpha Kappa Alpha Sorority, Inc. is open to women of high ethical and scholastic standards who are pursuing or have completed courses leading to a degree at an accredited college or university. Our official headquarters is in Chicago, Illinois. Nine Howard University students were led by Ethel Hedgeman Lyle into a sisterhood in 1908. Nellie Quander and her gallant group contributed the added dimension of a national organization and perpetual membership. Those who have come after them, the never-ending stream of eternally young, hopeful and enthusiastic women, must be remembered. 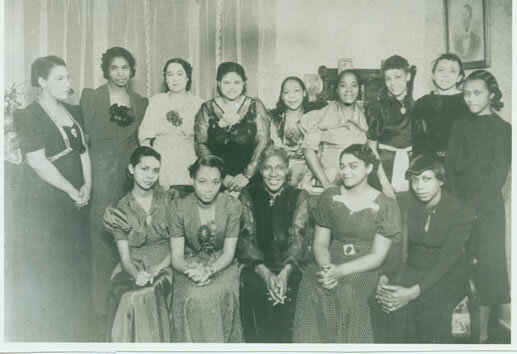 A local group of Alpha Kappa Alpha Sorority, Inc. women realized it was their duty to promote the Sorority’s International mission of Service to All Mankind to the Roanoke Valley and to extend the privilege of Alpha Kappa Alpha Sorority, Inc. membership to other deserving women of their ilk. Therefore twelve young women having graduated from college, met to discuss forming a chapter. Spearheaded by Eunice Poindexter the other members present were Hattie Witten Austin, Martha Coleman Bolden, Annette Means Cooper, Gwendolyn Johnson Lawrence, Hortense Tonsler Macklin, Helen Ricks Saparo, Gertrude Turner Scott, Elizabeth Taylor Smith, Alice Louise Turner, Sylvia Means Weeks, and Dorothy Dodd Witten. As a result of their efforts, Beta Chi Omega was chartered on December 3, 1938. The first officers of the newly formed chapter were: President, Eunice Poindexter; Vice President, Martha C. Bolden; Recording Secretary, Alice L. Turner; Corresponding Secretary, Sylvia M. Weeks; and Treasurer, Annette M. Cooper. The first Founders’ Day was celebrated January 15, 1939 in a public meeting at the Fifth Avenue Presbyterian Church. On October 21, 1939, the chapter had its first initiation, bringing 13 new ladies; Members Pearl Branch, Frankie Halsey, Edna Holmes, Mildred Turner, Mary Brown, Clara Seay, Roberta Claytor, Letitia Penn, Lillian Smith, Eulah Vaughan, Lillie Wright, Annie Sykes, and Christine Butler. On October 4, 1939, following the National Sorority’s lead at that time, the chapter soon organized what was known as the Patroness Club. These ladies were the mothers of the charter members and influential women in the community who were mother figures. Members Alice Turner, Eunice Poindexter, and Annette Means Cooper were the first delegates to attend the Boule held in Boston, Massachusetts in December 1939. Through the years, as a member of the Mid-Atlantic Region, Beta Chi Omega has grown aplenty. The chapter has a membership of 70 and has charted three undergraduate chapter in the area: Tau Zeta – Washington and Lee University, Theta Phi – Virginia Polytechnic Institute and State University, and Theta Chi – Radford University. Beta Chi Omega Chapter readily serves the Roanoke Valley via our national programs, currently themed Exemplifying Excellence Through Sustainable Service under the leadership of Madam Supreme Basileus Glenda Baskin Glover, Ph.D, JD, CPA. We are committed to serving our community via the five national program targets: HBCU for Life: A Call to Action, Women’s Healthcare and Wellness, Building Your Economic Legacy, The Arts!, Global Impact, and the signature #CAP program along with local chapter initiatives that are being refreshed and new chapter initiatives that are being implemented. In 2018, Beta Chi Omega extended their service effort in the Roanoke Valley by creating Ivies Incorporated of the Roanoke Valley, their incorporated entity that serves as the philanthropic arm of the chapter. Beta Chi Omega Chapter has been a vital part of the Roanoke Valley for 80 years. The Chapter looks forward to many more years of providing service through innovative programs in our community. Beta Chi Omega Charter Members — Posed for a group picture (circa 1938). Past Chapter Presidents (List): Members Eunice R. Poindexter*, Martha Coleman Bolden*, Gertrude Scott, Pearl Fears*, Alice Turner*, Talma Dowe Perry, Marionette Sprauve*, Mary Allen*, Maxine Nicholas Hunt, A. Lorraine Johnson*, Nina B. Medley*, Elizabeth Gillis, Debbie Payton, Rose Hackley-Hale*, Brenda A. Powell, Cynthia D. Coles, Demetria R. Tucker, Benecia Hale-Hilton, Carla L. James, Tamara Futrell, and Pam Edwards. Chapter Members Who Have Held National Office: Members Eunice R. Poindexter*, served as Regional Director for the National Non-Partisan Council on Public Affairs, under the leadership of Norma Boyd a Founder. Chapter Programs of Service (National and Local Community) – Highway Clean-Up, Black Family I and Black Family II, Health, Henry Street Festival Children’s Activity, AKA Reading AKAdemy- Forest Park Elementary School, Economic Empowerment, AKA On Track Program for Girls- William Fleming High School, Lucy Addison Aerospace Middle School and Forest Park Elementary School, Martin Luther King, Jr. Day of Service and the Annual Scholarship Awards to area graduating high school seniors.. Beta Chi Omega Chapter sponsored the first after school tutorial program in the City of Roanoke for African American students. The Roanoke City School Board was so impressed with the chapter’s program that they approved implementation of the program at the newest elementary school (Lincoln Terrace). 1940-1950, The chapter hosted a Costume Ball annually. 1958-1980’s, The chapter hosted the popular Cinderella Ball fundraising event annually. 1960’s, The chapter hosted numerous plays directed and produced by members of the local chapter. Hosted an annual basketball classic between North Carolina A&T State College (Greensboro, NC) and Virginia State College (Petersburg, VA) which became one of the chapter’s biggest fund raiser. Sponsored two graduate chapters, Kappa Delta Omega (Martinsville, VA) and Tau Mu Omega (Christiansburg, VA). May 4, 1974 sponsored two undergraduate chapters, Theta Chi (Radford University) and Theta Phi (VPI & SU, Blacksburg, VA). 1983 30th Mid Atlantic Conference (Virginia Beach, Virginia)– Mayor Noel C. Taylor, the first African-American to serve as Roanoke City’s Mayor, was selected the Citizen of the Year. January 26, 1985– Project Respect was organized in conjunction with Planned Parenthood. The purpose of the project was to make teenage girls aware of the consequences of an unwanted pregnancy. 2001 to present, Chapter has hosted annually the UNSUNG HEROES PINK ICE BALL. 2002 to present, Chapter has hosted annually the AKA Man of Distinction Contest. December 8, 2006 -Chapter hosted celebrity comedian Rickey Smiley Benefit Performance at Shaft Man Hall Jefferson Center. August 24, 2013 – Chapter and DST hosted author/activist Kemba Smith Pradia for joint sisterhood brunch standing against domestic violence (Past Supreme Grammateus Susan Simms Marsh attended). Marylen Harmon received the prestigious Graduate Award at the 1998 Boule in Chicago, IL. Founders’ Day featured speakers- Past International President, Dorothy Boulding Ferebee and Past International President, Edna Over Campbell (then Grady). Founders’ Day 1970-Past International President Loraine Green was the keynote speaker.1987 (five living charter members present- Members Eunice R. Poindexter*, Gertrude Scott*, Helen Ricks Saparo*, Dorothy Dodd Witten* and Gwendolyn Johnson Lawrence*. Founder’s Day 2008 – Featured Speaker Rev. Dr. Cynthia L. Hale (one living charter member present – Dorothy Dodd Witten*). Hosted the 1969 Mid Atlantic Regional Conference at Hotel Roanoke– Regional Director Pauline C. Morton. Hosted the 1989 Mid Atlantic Regional Conference in Crystal City, Virginia- Regional Director Marye Jeffries. 2006 Regional Conference–Northern/Western Virginia Cluster Clusters (3) Holiday Inn and Scarlett’s Restaurant October 23, 1999-Northern/WesternVA at the Clarion/Sheraton Hotel. Fiftieth Anniversary Celebration, 1987 (five living charter members present – Members Eunice R. Poindexter*, Gertrude Scott*, Helen Ricks Saparo*, Dorothy Dodd Witten and Gwendolyn Johnson Lawrence. October 23, 1999-Northern/WesternVA at the Clarion/Sheraton Hotel. Fiftieth Anniversary Celebration, 1987 (five living charter members present – Members Eunice R. Poindexter*, Gertrude Scott*, Helen Ricks Saparo*, Dorothy Dodd Witten and Gwendolyn Johnson Lawrence.